Winning the May box office campaign puts a film in strong contention to win the entire year. If we lined up ten box office analysts and asked them to pick the biggest film of the month, I'm certain we would get at least four different answers. It's entirely possible someone would get ambitious and take Star Trek as well. Any time we're talking about a month with four or five legitimate contenders for biggest film of the month as well as the year, we're in rare box office territory. This is a perfect storm of spectacular releases with the obvious question being whether all of them can survive in such a competitive marketplace. 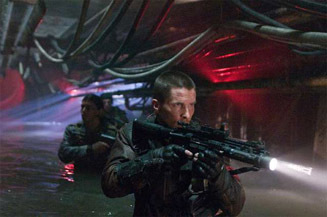 I have chosen Terminator Salvation as the biggest film of the month for a few reasons. I am aware of the fact that Terminator 3: Rise of the Machines earned "only" $150.3 million domestically, a total that may not get Salvation into the top five if there is a similar performance here. I am also old enough to remember the release of Terminator 2: Judgment Day, however, and that factors into this equation a lot. That film inflation adjusts to right at $350 million, giving us a remarkably large fluctuation in the upside and downside here. The X-factor is obviously the presence of Christian Bale, an actor whose last film was...somewhat successful. The question is whether The Dark Knight's success is significantly attributed to him or if it was mainly Heath Ledger's performance as The Joker. I am inclined to believe that this is one of those rare instances where the perfect actor gets the perfect part at the perfect time. If I'm wrong, this prediction could wind up looking silly, but I expect this to be the second biggest opening of the month and the best overall performer.